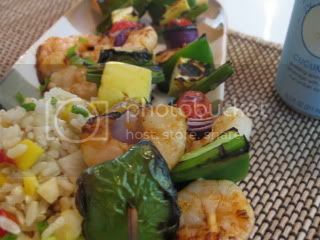 Combine shrimp through olive oil and set aside to marinate while you cut up the vegetables. 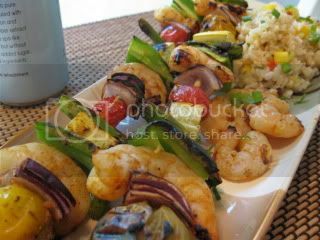 Thread tomatoes, onion, shrimp, pepper, squash and asparagus alternately onto each of 8 skewers. 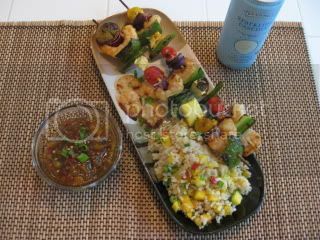 Pour remaining sauce of shrimp skewers and you are ready to go. If using the oven, Broil 4 minutes or until shrimp are done, turning once. 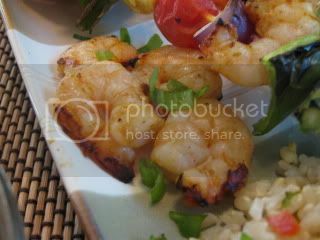 If grilling, grill for 3 minutes on each side or until shrimp are opaque. 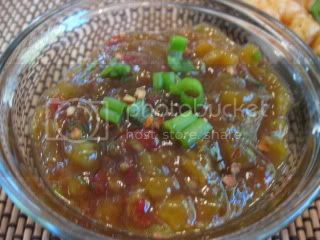 Combine remaining lime juice, chutney, and remaining ingredients in a small bowl, stirring well. You may want to blend the chutney sauce if it is too chunky. Sprinkle with additional red pepper flakes and green onion, if desired. 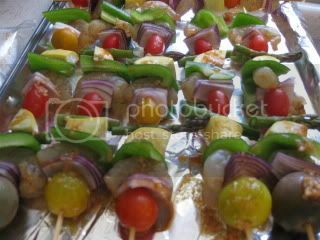 Makes 4 servings, 2 skewers with 1/4 cup sauce (4 WWP each). Here is what they looked like getting ready to go on the grill. And, coming off the grill ~ grilled to perfection. I had a few extra shrimp that I grilled all on one skewer. And dipped them in the Spicy Mango Chutney. 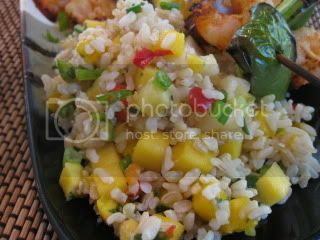 I made up a quick, Tropical Brown Rice to go with it. It’s so simple. Heat up one packet of Trader Joe’s Frozen Organic Brown Rice in the microwave for 3 minutes. Mix in 1-2 sliced green onions and add sea salt/freshly ground pepper to taste. All together with a new Organic Cucumber Sparkling Water I was trying out to get ready to get into the “spa” spirit. I honestly thought the fizzy water was super funky ~ maybe I’ve used too many smelly lotions, but, the taste of cucumber melon didn’t really seem like something you should be eating. However, to be a good review, here are some pictures. You can click any of the pictures below to make them bigger. Just a few more hours for your chance to score some FREE GNU BARS. Click HERE for your chance! Thanks for the vegan alternative! Oohh, looks delish! If I had a grill, I’d definitely make those. Maybe they’d work under the broiler? I’m echoing Broccoli Hut but thanks for the alternative recipe! That sounds delicious!! Meganerd ~ You can do this in the oven (broil them as noted above) or if you want, get a mini Hibaki BBQ grill – I think Walmart has them for like like $20 for the gas ones. They are super cute and it’s what I used until I got a big grill. K ~ Thanks ~ do tell if you try it out. Um…holy crap – these look great. Jane ~ LOL – yup, they were great and so easy to make!